This handsome Buddha is the work of an accomplished sculptor who has deftly harmonized quite distinct aesthetic norms and techniques in a most sensitive sculpture of Sakyamuni as a teacher. This iconography was particularly popular in both Kashmir and Nepal in the tenth to eleventh century, and here the artist has adopted the Kashmiri technique of using brass alloy with silver and copper inlays as a complement to the Newar grace and elegant modelling of the body. Although Sakyamuni has the sacred marks of the ushnisha and elongated earlobes (due to his having worn heavy earrings as a royal child), he otherwise appears in human form. He stands with shoulders and feet aligned, but the right hip is bent, pushing his left knee slightly forward. This position is called abhanga, a lightly flexed standing pose. His right hand forms the gesture of charity or gift-bestowing and the first joint of the thumb is bent. 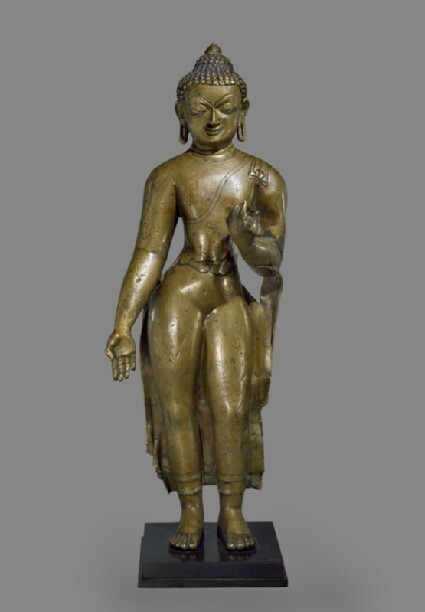 This delicate bend of the thumb in Sakyamuni's gesture may be observed on a masterpiece of Newar workmanship of the tenth to eleventh century, now in the Potala at Lhasa, which strongly resembles the Ashmolean Sakyamuni but instead is cast in a copper alloy, with a height of 71 cm . The strong character of this Buddha's face is conveyed through its broad planes and the silver and copper inlays in the eyes and lips. The forehead has a very wide hairline. The eyebrows have deeply incised carving to form a very high arch. The brows are now filled with matt 'cold gold' paint, but it is evident that there was formerly a dark colour inlay. The eye socket is rounded; the heavy upper eyelid has a curving dip and is bordered by an incised outline, as if the Buddha were wearing kohl. The eyes are inlaid with silver; the pupils are now absent but formerly also had inlay in a contrasting colour. The narrow nose is aquiline, the nostrils perfectly formed. The lips have copper inlay. The mouth is closed and the lips are bow-shaped, slightly pursed and smiling. The earlobes are not finished with two lobes but there is an outer rim to represent a fold of skin. The shoulders are quite strong and massive, as are the arms, while the wrists and hands are more delicate. In the garment of the left hand, there is an unusual hole for a missing element, possibly an ornamental swag for the fabric. The nails and joints of the fingers are very clearly defined. The Buddha's raised left hand clasps the hem of his upper monastic garment, the uttarasanga, which is draped to cover only the left shoulder. The excessively narrow waist has a crack above the navel which is emphasized by incised carving . The robe clings closely to the body, the fabric barely visible save for the pleated robe-edge at the shoulder and the inlaid hem of the robe which crosses the torso. The thighs and legs have the same strong and heavy proportions as the arms and shoulders. The robe extends in side flaps from the legs, but there is little volume to the fabric. Indeed the metal has now broken at the edges and the original shape of the full robe is no longer clear. The upper robe finishes above the ankle, just revealing the hem of the lower robe. The back of the statue is unfinished and on the whole it is not polished, though the silhouette of the body is modelled and the elegant bend of the hips is pronounced. This summary treatment of the back is frequent in the sculpture of western Tibet . Tibetan consecration practices are indicated by the large rectangular segment extending from collarbone to waist at mid-back, which is probably for consecration contents. This evidence of consecration points to a Tibetan origin for this sculpture. Tibetan worship patterns are further indicated by the blue pigment of the hair and the gold paint inlay of the eyebrows. These factors, as well as the harmonious fusion of the Newar and Kashmiri aesthetic norms, suggest a provenance from west Tibet, at the height of the artistic achievements of the Guge kingdom in the late tenth to eleventh century. 1 von Schroeder, Buddhist Sculptures in Tibet, vol. 1, pls. 142D-F.
2 The proper left shoulder has a weak segment with a vertical break from shoulder to elbow and a segment which has been crushed (now open to the air; no contents are visible). The back of the head also has a hole, which reveals the construction of the curls. 3 Reedy, Himalayan Sculpture, pls. W125-6.